I am planning on building a couple of gaming boards 1200mm x 1200mm (4' x 4') with 300mm x 300mm (1' x 1') 3d foam scenery boards that will be placed on top of them with smaller terrain pieces such as forest/jungle boards with small croppings of fluorescent and multi coloured aquarium trees, some plastic venus flytrap and other exotic resin man eating plants mounted on small round basing discs that are then placed in small prepared holes. Also some ruined gothic and temporary construction type prefab sci-fi buildings, tank traps sand bag walls, bogs/ marshes with floating lily fronds and weird alien looking insects on them, low hills a small stream going through a couple of the boards sections, and any other odd things I might think off such as a wrecked tank/ APC (I think an APC as I have about 25 or 30 Chaos Rhino APCs still in the boxes with heat shrink plastic. I might even build some nasty looking alien giant bird spider nests or other nasty terain features that could kill you if not careful. I have already purchased the following items, some of which are still in transit. A large array of "on sale" aquarium plants in many fluorescent and bright colours. 1Kg bags (that is 2.2 pounds for those in the USA) of coloured flocking in yellow, purple orange, blue and plum. There is a large variety of standard coloured terrain add ons such as grass, wheat grasses (looks like bundles of fine straw), pebbles, gravel, and other basing packs you get from varied gaming suppliers. Composite board basing pieces and cork tile pieces in a variety of shapes to mount terrain on. 2 of - 1200mm x 1200mm sealed plyboards. PVA glue, Polyfilla which added to water will make Yuck whjich when hardened will be able to both create shape and seal areas where I want to make fill-in ground that the round tree bases fit into, and to make the hills and add on board features smooth down easier so they look more like part of the table. Tooth Picks, small and large Paddle Pop sticks, and long lengths of Dowel which look like scaled down 4"x2" planks for making a large variety of wood and barricade features. Paint Brushes, Paints, Water effects 2 part epoxy and add in colour to add to each layer poured. I want to buy and have sourced a place to buy 300mm x 300mm x 25mm or 50mm high "High density extruded foam" sheets. Also need for making fungi - Lentils, mung beans split peas. 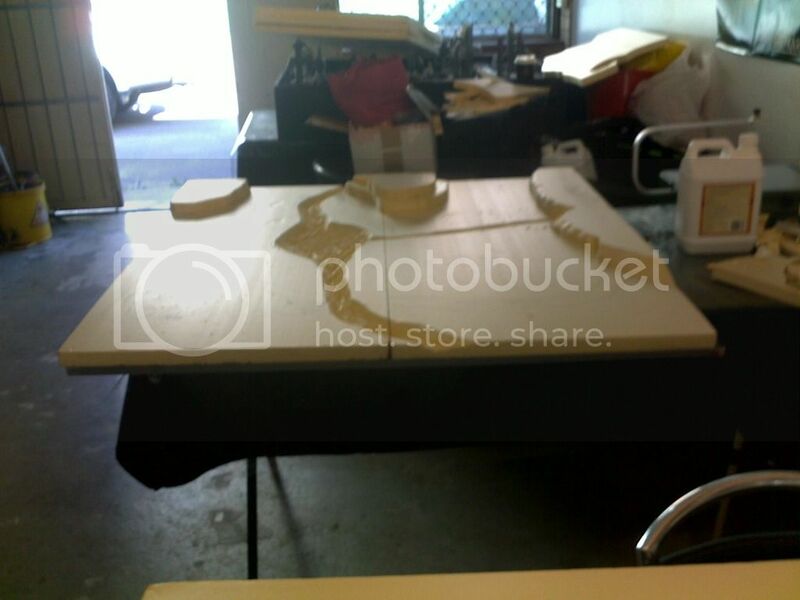 Foam specific glue to put foam board sections together for making hill heights, etc and tools for cutting and shaping foam such as heat wire cutting tool, and sanding tools. I need to source a lot of the buildings I will using for the random ruined terrain and temporary construction exploration buildings, weapons and MG pill boxes and so on. I was looking at some of the New Zealand made GF9 Battlefield in a box buildings, however most of the project buildings I like that they have made are no longer made by them, and are very hard to get hold of and very, very expensive to get posted out from the USA (which is where most of them on E-bay are being sold from). I will be getting my local hobby store to help me with the project, and as I proceed with they various stages of planning, and building, I will be taking photos and adding them to this thread until the project is complete. After completing the Venusian Jungle board, I will likely be constructing a Red Planet Mars board for my Capitol army to play on. Lots of gullies, Mesas, trench warfare positions with sandbag walls, trenches, pillboxes, MG nests, Artillery pits, Command bunkers, look out towers, generators, supply depots, storage buildings, vehicle repair bays, strange desert cacti, tumble weed type plants, alien desert planet flora (not too much in the way of plant life however) and any other Mars and Desert planet scenery you would expect. Ruined old west type buildings, Water towers, water troughs, acid pools and what ever else I can think of later on. I will start on the project once I get all the basic supplies, and equipment gathered. The buildings are going to be the hardest thing to get at this stage. I have an idea for making Venus fly traps using easy to obtain items and hobby goods. I have checked on the internet and a bunch of plastic terrarium plastic ones mounted on a base is about US$25.00 to US$35.00 plus postage which is generally between half and 3/4 of the cost of the goods. Hence I had to come up with an alternative. Here is the idea. Get a few bottle top caps. Preferably the ones with the rubber sealant lining. drill a small hole in the centre for the stem to be mounted onto. then with a vice or a lot of strength and pliers fold the bottle top in half to make it look like a mouth with the teeth pulled out. this would give the general shape of the plant. to make the fronds/cage bars that trap the insects I will use fine wire, preferably from a 6mm or 25mm squared green yellow internal earth cable which I can get from a local electrical or Cabling supplier. The internal cable has dozens, maybe as many as 50 - 60 wires. Make sure it is internal as external uses thicker copper wires. I would then glue the thin and cut to a short length wires to the cap in the grooves, and add even small lengths in the internal maw/mouth of the venus fly trap to represent the traps sensor hairs. I would have a small nail or something else like a pin with a fairly flush head on it, and then glue and insert this into something that would be the stem of the Venus Fly Trap. So far I have that worked out. Perhaps use some textured paint, or filler to hide the unwanted bottle top cap ridges and give it a natural texture to it inside. Finding something that is strong and flexible and comes in decent lengths that can be cut to the desired length to make the stem is my problem. I had thought of thin flexible tubing, however most tubing that is flexible is also too hollow. Any ideas on something I could use? If you think the tubing would work as I have seen some that comes in clear tubes for how could I stiffen it enough to hold the weight of the bottle top caps and still keep it light weight? I plan to paint it later on and base the plants. Maybe even give the plants spiked grabbing tendrils/ roots like those in the Journey to the center of the Earth movie. I know a lot of gamers out there use various hobby / industrial and other things that could possibly help. O.K. I finally got a lot of the important equipment and supplies for the Venusian Jungle terrain board. I started on the basic design and cut a few of the hill shapes, glued them together and then cut out the very small stream which runs into the creek which will have a pond in the middle of it. I will add in a few ruins, gun emplacements, bunkers. I will have to sand down the creek, even out the creek with Spakfilla and water. This is then sanded down. The hills, and any surface that needs it will have spakfilla put onto it to fill in gaps, even out the terrain, etc which is then sanded down. The whole table then gets a layer of sand glued onto it. This is sealed with PVA and water 50/50 sprayed onto it and let to dry. Next I paint the sand, and put successive layers of dry brush over it making sure it is a gradual colour change and highlighted only slightly. I think I will likely use Grey/dark grey as my sand colour. It goes will with the pinks and purples of my Venusian Bauhaus colour scheme, and the grass colours which will be placed on top of the sand in patches once it dries and has had a final layer of PVA 50/50 and water to seal it all. I plan to use a fine almost powdery coloured grass I got from the U.S.A. which unfortunately is not as course or heavy as I would have liked it to be. It means I will have to make sure there are no fans or breeze in order to make the grass stay put. I am being instructed/advised by one of the local gaming store employees on some of the finer techniques they use in store. He had told me that I will need to use the PVA 50/50 water mix and dab it on with a paint brush. Then add the grass, pat it down onto the table using one colour at a time, let it dry, and after the hour or so, pat the excess off, and repeat the process with each remaining colour. The grass colours I purchased are: yellow, Royal Blue, Royal Purple, Plum and Orange. Once I get past that stage, I will have to work on the creek, and Kym will advise me on what to do with the 2 part epoxy I have for making water effects. I will also make Lilly pads using either the aluminium foil sealant from coffee jars which will be shaped to look like Lilly pads, or plastic bottle of various sizes which I will cut the bottoms off, cut a slit in them and gently apply heat and use a small pair of rounded tweezers to make the shape of the Lilly pad edges. depending upon which works best, I will then paint them and place them on the top of the pond. I also purchased a few packs of Starship Troopers Brain Bugs which look like large insects or water skippers (for the scale they are being use with). I will put these on top of both the pond and the Lilly Pads. I am going to make a lot of bases with small clumps of foliage using a large collection of brightly coloured aquarium plants purchased after their Christmas sale. I will be making a number of venus flytraps, and have purchased a variety of alien man eating resin plants. I have also found a website or 2 that sell mushrooms and fungi, and I will be looking into buying some of these. A few well placed larger trees with some alien animals creeper vines, and so. I want the flora and fauna to break up the board, make it look like it is not all one height and all one mass of garish grass across the whole table. I know I will need patches of grey dirt, large brownish tree trunks, a few weird plants with teeth, eyes and creeper arms and dangerous animals and insects to be able to play with death world rules, and make the viewer intrigued and want to look more at the map to find all the hidden details. 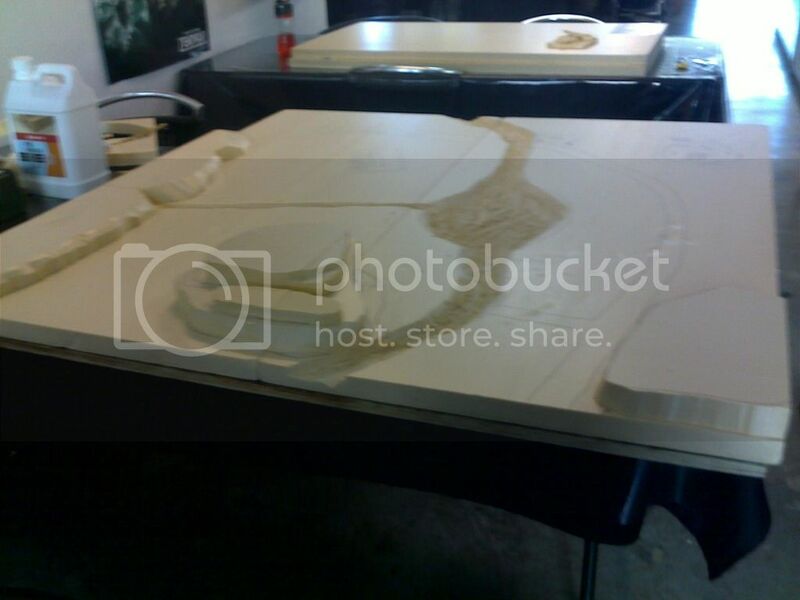 Anyway below are 2 photos of the initial stages of the first of 2 map boards. Its is made of 2 board sections which are 1200mm x 600mm (4' x 2') and these will be mounted on a hard board base. The second board will be developed later on, and will be designed to make a hidden valley on the other side of an escarpment that fits onto the first board, and have 3 hidden and dangerous entrances for human an possibly bike mounted models to pass through.